For an application demanding the very best lighting try our NEW CRI95 LED ribbon strip availabile in our LED strip lights range! This top of the range CRI 95 LED ribbon in 2700K will make any display stand out. 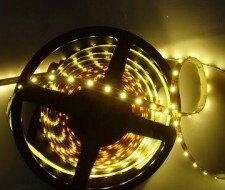 The SMD LEDs allow for great flexibility which in turn allows for stunning and creative effects. The ribbon can be cut every 50mm and reconnection is easy by using our snap-on connectors - no soldering necessary. Available by the metre or 5/10m roll. Backed with 3M adhesive tape for easy installation. Requires a 24V transformer - call our sales team on 01492 233002 for advice.